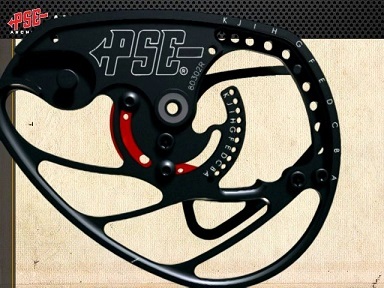 PSE Sinister is a unique design combining high performance, great maneuverability, forgiveness and great price. An almost impossible mix. Almost. The IBO speeds of 327 ftp would satisfy any bow hunter. In dense woods an ultra-compact 28” axle to axle brace height will be a bless. The forgiving 7-1/4″ brace height can be helpful after hours spent on a tree stand. Due to its single cam eccentric system tuning of this compound is very easy and maintenance is minimal. The icing on the cake is the affordable price tag on the bow. This rig was made with bow hunting in mind and scores high in all customer reviews. PSE Sinister is specially praised for its excellent value to price ratio. The riser of Sinister is made of strong and very light aluminium. It is exceptionally short and has large cutouts which bring its weight down. 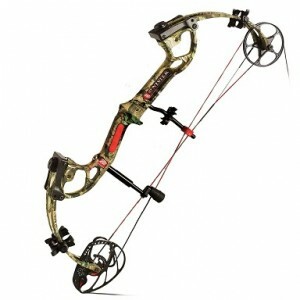 The riser has a classical for PSE bows shape and features a vibration dampener on the front. There is also a new cable guard system mounted on the front of the riser. The cable guard slides smoothly along the slider ensuring quiet and reliable operation. It has rounded edges to prevent damage to the string. PSE Sinister features a slim Raptor Grip that promotes proper hand placement. Its width is is enough to enable grip relaxation and at the same time narrow enough to minimize grip torque. The rubber plates on the side of the grip can be either red or black. The heavily preloaded composite limbs are in past parallel position. They have a high percentage of fully stressed working area on the limb which makes them highly efficient in storing and releasing the kinetic energy. Sinister is equipped with Brute X limb pockets that hold the limbs in place. Because they are longer than usual pockets there is more contact between the limb and the pocket which greatly promote proper limb alignment. The limb support is made of composite materials and features delrin bushings which guarantee perfect limb position during the shooting cycle. This system also allows for quick and simple draw length adjustment in the range between 50 and 70 pounds. PSE Sinister is a single cam compound which makes is a perfect choice for anyone that appreciate simplicity and reliability of such designs. At the same time due to the unique design of the famous AMP Cam it can deliver generous 327 ftp which by all means is a great result and something you wouldn’t expect from a single cam bow with such forgiving brace height. In fact Sinister comes with the exact same cam as Prophecy, the fastest single cam bow ever produced. The increased strength and reduced weight of this eccentric system was achieved by application of 7075 aircraft grade aluminum. Thanks to second generation posi-lock inner cam the draw length adjustment is quick and easy without a need of a bow press or additional cam modules. The adjustment range of the draw length is 25.5 ” – 30.5 ” in half inch increments. On the outer ring of the cam is a set of draw stops which can be easily changed with a hex key. The engagements on outer ring, inner ring and the posi-lock cam help making the adjustments and prevent from incorrect positioning of the screws. This cam system offers 75% let-off and due to the shape of AMP cam and reliable sealed bearings provide smooth draw cycle. BREAK-UP INFINITY – both limbs and riser come in a great camo pattern by Mossy Oak that provide unmatched realism and contrast in order to break up a hunter’s silhouette. 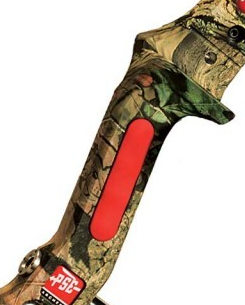 SKULLWORKS BLACK – a black and white camo pattern on both limbs and riser. The default finish option for most packages (including Ready-To-Shoot and Field-Ready packages) is BREAK-UP INFINITY. For each of the finish options there is a matching set of accessories available. Thanks to the new VibraCheck Limb Dampener band system eliminates after shot vibrations. They are made from specifically formulated elastomer for maximal absorption. The band is shaped in such a way that can either be installed on separate quad limbs or lock with a second band to work in tandem. VaibraCheck dampeners are available in several different color options. After shot string oscillations in PSE Sinister were virtually eliminated by VibraCheck Backstop 2 system. It prevents the string from producing any noise. The Backstop 2 dampener is highly adjustable and needs to be tuned if you change the draw weight of the bow. It’s made from lightweight aluminium and allows for ¼ inch lateral adjustments. The bumper can be optimally positioned thanks to pivoting mount. It also has additional lateral micro adjustment for fine tuning.